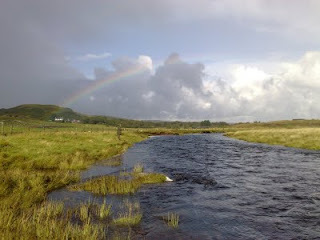 I've spent two days stalking with Jim Tod at Tarvie, near Pitlochry. Hard work, but we got a stag each day and, as always, it was a privilege to spend some time in this magical place. Talking of Mark Gilchrist (as I was in the previous post), I visited him today to get some new photos for his cookery series. We larked about doing some fashion-style shots (check them out on flickr), then got down to business and went off to look for a fallow buck. 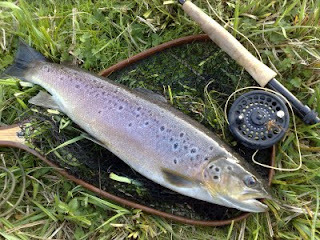 Just as it was getting dark, Mark spotted this one - a candidate for culling if ever I saw one. 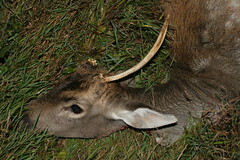 It had a single, dagger-like antler which would have been deadly in the rut. Plus one ankle had been broken at some time. It was badly swollen, and that leg was considerably shorter than the other. All in all, a beast that was better off hanging in the larder. Mark Gilchrist tells me he was stopped by the police on his way back from the Midland (towing a trailer through Kent villages late at night tends to attract attention). Name? Mark Gilchrist. What, the Mark Gilchrist?! 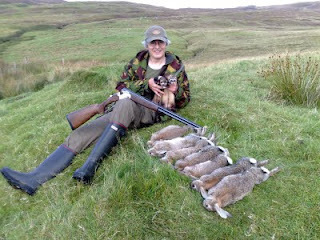 Turns out the copper is a regular Sporting Shooter reader, and reads Mark's cookery feature each month. 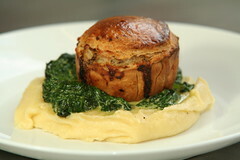 He's particularly keen on Mark's rabbit pie recipe, which we featured in a recent issue. Can't argue with that, it is delicious! Just in case anyone doubts the anarchist/terrorist motivation of some antis, here's a bunch of loonies bragging about how they bravely set fire to some wooden shooting butts and smashed a pheasant pen. I can (just about) stomach people who're concerned about the potential for cruelty in shooting, or who think we have a bad effect on the environment - especially if they're willing to find out for themselves and make up their own minds. The bragging 'liberationists' are something else. These people are not only stark raving mad, they are dangerous, and they're in the countryside burning and smashing. 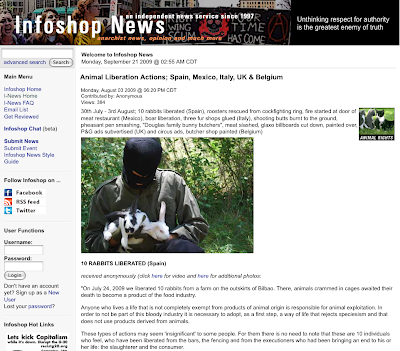 Encouraged by 'legitimate' animal welfare organisations, they do untold harm around the world (examples from the US here). 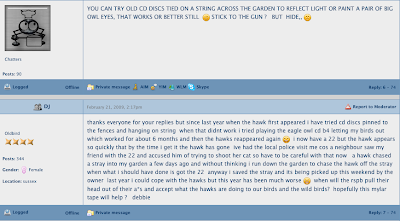 I do hope the authorities treat this as seriously as they do looking for people 'persecuting' birds of prey. This is a FUD (Fold Up Decoy). Produced by an Australian company, it's supposed to be the next big thing in decoying. I've had a look at them at the Midland Game Fair, where they're being sold by decoying.co.uk, the official UK importer. It seems great - basically the decoy is made of neoprene with a fabric facing (similar to a mouse mat), printed with photo-quality images of the quarry - there are already pigeons, duck, geese and crows available, with more species coming soon. The great thing is they're light and easy to carry - you can clip a couple of dozen to your belt. Once in position, fold them out and set them up. The design allows 'feeding' and 'sentry' positions, and the duck decoys will float right-way-up. Plus the people behind them are full of enthusiasm and promotional ideas - I reckon we'll be seeing a lot more of FUDs over the coming months. They're on sale at the Midland GF for £25 for a pack of 6 pigeon deeks; if you can't make it to the Midland check out www.decoying.co.uk for more info. 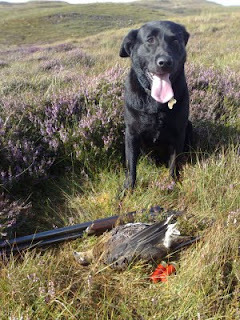 Staff at Sporting Rifle magazine will get a laugh next Thursday, 24 Sept, if they pop to the shops at lunchtime. A bunch of whining antis will be handing out their tatty leaflets off a wobbly trestle table outside H&M in The Parade, Leamington Spa. 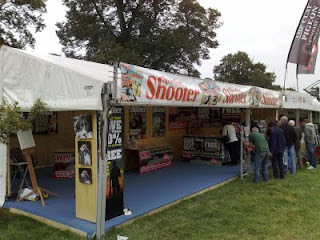 It's part of Animal Aid's grandly-titled 'Anti-Shooting Week Tour', an annual damp squib which is notable for the complete lack of interest it generates among media and public alike. Hope it rains. UPDATE: The RSPB's Mark Avery is now drawing attention to the story linked below, and dropping heavy hints that "we will hear more about this". I suspect he, and others, may know more than they're letting on. The BBC is reporting new findings on lead from a study at the University of Bristol. Apparently even 'safe' levels of lead cause poor educational achievement, antisocial behaviour and hyperactivity. And they've 'taken account of factors likely to influence the results', so it must be true. This piece has to be a candidate for Bad Science. At best it demonstrates a correlation, not cause and effect - a point completely lost on the Health Protection Agency and the BBC reporter who unquestioningly repeated their propaganda and thereby bolstered its credibility. Never mind the truth, expect a renewed campaign to ban lead in shotgun cartridges and rifle bullets soon. When I dared to question the RSPB's sincerity about working with shooters in a previous post, I was told in no uncertain terms that "...if you have evidence of offences being committed against birds of prey it is your duty to report them". Well here you are then. I have uncovered evidence of birds of prey being shot and trapped. 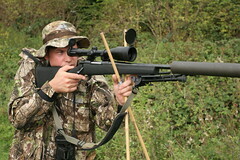 Methods include shooting with a .22 airgun, trapping in a Larsen-type trap, and entangling in multi-mono netting. The culprits have admitted their crimes, all that remains is for the RSPB and police to bang their doors in at 4am and cart them off to jail. Unfortunately I don't have the resources to follow this up personally, but do let me know how you get on, guys. I filmed this day with Mark a while back and never got round to editing it. He got so fed up waiting for me, he nabbed the tapes and got the job done himself! Nice work, I reckon (under 18s cover your ears at 01:43!). Today I met up with Roy Lupton, and the goshawk chicks that have been starring in the fieldsportschannel.tv series, for their first outing after live quarry. Hawking is completely new to me, so it was fascinating to see how it works. We started in the woods, using ferrets to bolt rabbits. The young goshawks seemed a bit fazed by all the cover, and never really got onto the rabbits, so we moved out to the field and Roy worked his pointer until we found a youngish covey of partridges. In a blur, a bird was in the air, the goshawk was released, and the two birds tumbled to earth together, the goshawk 'hooding' its catch in that distinctive way. It was a privilege to watch, and a nightmare to photograph! I receive a good few 'Letters to the Editor', many of them grumbling about small errors in the magazine. Recently an older reader wrote to complain we'd referred to rabbits as 'bunnies', which he found patronising and childish. He has a point, but I doubt that many readers are troubled by that one. All in all it's valuable feedback, and helps to keep the magazine on the right track. With the increase in overzealous police officers arresting LEGITIMATE shooters, I wish to add my penny’s worth. Slightly left of field I know, but it needs to be said that it is not just the police that require education about our sport, its pleasures and its many hurdles imposed on us by the current disingenuous government and their foot-soldiers. By and large shooting is carried out by law-abiding and in many cases respected individuals. Where at all possible we respect whatever the law throws at us. Yet a large proportion of people would have you believe we are all social pariahs and are putting planet earth at risk. Utter tosh and a very sad indictment of what (some) police and the public think of us and our sport. 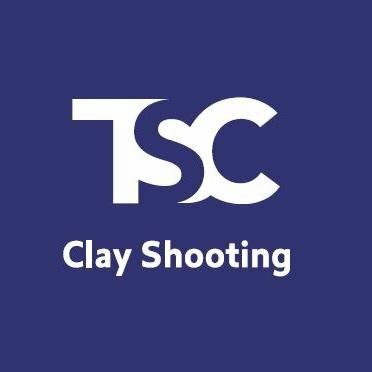 I am legitimate gun owner who has served in the British Forces and shot a myriad of large and small calibre weapons, but now stick to my weekly shoot at both clay ground and rough shoot. I believe, whilst you never stop learning, I am a pretty safe bet. 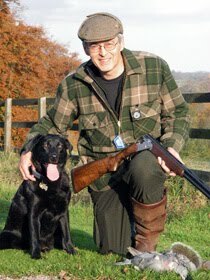 A few weeks ago I was enjoying of a glass of beer when to my left a rather well oiled punter started to advise me as to why my sport was the ruination of wildlife and posed numerous dangers to the public in general. Needles to say by the time I had EDUCATED this man in the way of our sport and its not inconsiderable revenues to our rudderless government, he to be fair, had changed his thoughts 180 degrees. It did not end there though, as I made a point of advising him that he, after drinking well over the limit, was about to drive home and endanger far more lives, wildlife and indeed planet earth than any amount of shooters would ever do. We as shooters are pigeonholed and pilloried as bunny slaughtering, noise producing, lead poisoning, gun toting hillbillies - when in fact a little education would show the amazing amount of good we do in many ways (too many to mention). Outside the shooting community, how many people have heard of George Digweed, Richard Faulds and Mike Yardley - a 16 times world champion, an Olympian and a fabulously erudite shooting ambassador, respectively? I would guess not many at all. Yet mention another sportsman, no matter how odd the sport, and more will know their name. Education and bringing pressure to bear on our lame, Politically Correct, public fund wasting governmental apparatchiks, is what is needed. Whatever next: they will be taking penknives off scouts! ... and if that's put you in the mood for sedition, try thriller writer Dennis Wheatley's Letter to Posterity. [full text here in pdf format], [video of BBC documentary here]. Rebel! On Robjents special daddy long legs. 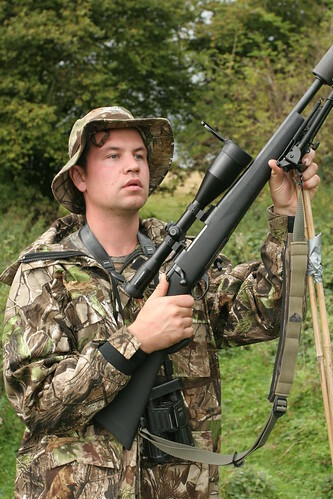 Is the RSPB serious about working with shooters? 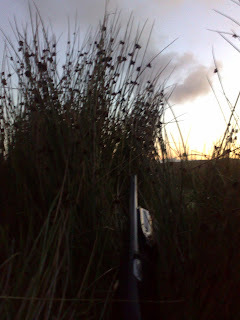 The RSPB periodically pays lip service to working with shooting estates and organisations. On occasions, you'll even see them paying tribute to a gamekeeper who has dobbed in a miscreant, or acknowledging the cooperation and valuable conservation work by shooting estates. And then just when you think they can't be all bad, they stick the knife in. As with their "Vision" to resolve the hen harrier / grouse shooting conflict. The RSPB is one of several partner organisations in the Langholm Moor Demonstration Project, designed to look at just that subject. It's a long-term project, in its early stages. There's an understanding among the partner organisations about not running off to the press shouting your mouth off, taking a tiny sliver of the results totally out of context, and failing to give credit to all the other organisations involved in the project. Which is exactly what the RSPB has gone and done, so far as I can see. How can you work with people like that? On top of which, their "Vision" is misleading and disingenuous in the extreme. The harrier problem is hugely complex, and there are many many reasons why you might find fewer "recorded" harriers in this or that place than the RSPB in its wisdom decrees suitable. For instance, I've recently spent a fortnight in Scotland's Wild West. It's a land of wind, rock and water, where the law hardly reaches more than 10 yards from the main road. Far up a glen, a harrier nest was destroyed last year. Trampled. By persons, or perhaps animals, unknown. The chicks were crushed. 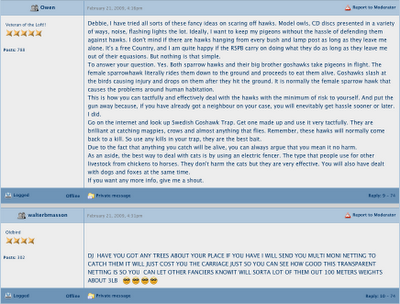 The RSPB have done such a good job of maligning shooters, that the primary suspect was "shooting interests". But there aren't any. Except me and my dad, who walk-up perhaps 3 brace a year between us. And we have better things to do with our time than go round stomping on harriers. Actually we rather like watching the little blighters. In the event, the "evidence" rotted before anyone got around to sending it off for analysis. The case was forgotten, perhaps an accident, perhaps a deliberate act by one of the local farmers who stand to make a small fortune out of the new windfarm, and might have seen harriers as an obstacle to their new found riches. We'll never know. Without a "shooting estate" to blame, no-one, least of all the RSPB, gives a monkey's. I could tell you similar stories about the golden eagles that nest in that glen. Year after year their nests mysteriously fill with rocks. Until quite recently a good few of them ended up poisoned too. And shooting had nothing to do with it. I could help the RSPB get to the bottom of what's going on in that remote spot. Because I know every crag, every clump of heather, every pool of the burn, like no-one else on earth. And I'm not going to. Because I can't trust them not to double cross me and grab another opportunity to shaft shooters. I wonder how many other shooters are in a similar position? The RSPB won't be losing any sleep over it. Their Scottish membership figure has just broken another record. Due, in large part, to the lies and misinformation they spread about shooters. Does this look like shotgun damage to you? Daily Mail columnist Liz Jones moved to Exmoor and has done a splendid job of making herself unpopular with locals with her special blend of condescending, mickey-taking, whining and completely failing to understand country ways. 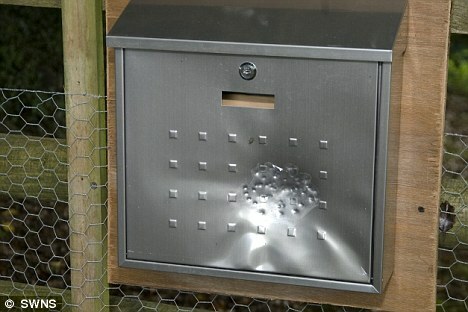 Now someone has taken a pot shot at her letterbox (pic above)... or have they? Could it be a special load? 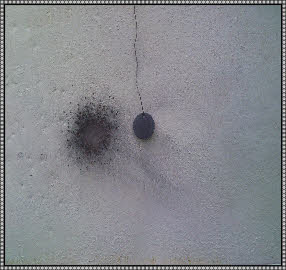 The pellet marks look quite large, perhaps BB, but again they're not spaced right. At that range (this would have to be 5 yards at most, to have such a restricted spread) you'd expect a very dense centre. You'd also expect the steel to look more evenly dished - the mailbox has a crumpled look about it, almost as if the individual strikes occurred separately. A rifle perhaps? 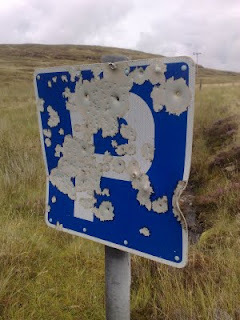 A centrefire or even a rimfire rifle would have put its bullets straight through that steel (as in that parking sign I photographed recently). Multiple airgun pellets? Doesn't look like it. In fact, it looks to me a lot like someone whacked the box multiple times with something hard and pointy, to make it look like a gunshot. And I wouldn't put it past an anti to have done that to get shooting a bad name. It seems Ms Jones isn't a big fan anyway: "I don’t agree with blood sports, but I’m not alone in my views. In one village, residents are so fed up with the noise and mess from pheasant shooting they want it banned." Hmm, more whingeing incomers eh? I bet the locals love them too. Fear not, Avon & Somerset's finest are on the case. A spokeswoman said: "We’re treating this as damage to a mailbox." Meanwhile Ms Jones appears to have missed the point: "I don’t mind people hating me, but if they do drive me out of the area, lots of people I employ will be made redundant," she writes. 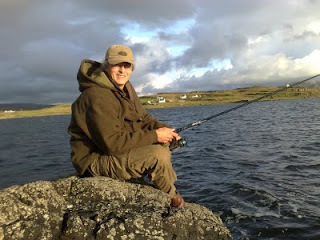 "I employ a local gardener, tree surgeon, equine vet, two chiropractors, an equine podiatrist, a holistic shearer, an ecologist..."
After mackerel, but caught a sea trout. P is for... Pattern Plate? 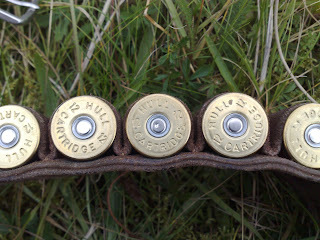 You can see the feeble dent that failed to fire the cartridge - it cost me a grouse! After all my planning and reconnaissance, I got into position early this morning only to discover that the geese had chosen this of all mornings to get up even earlier, and were long gone. Ah well, better luck tomorrow perhaps!